This article by LIZ LEICESTER describes an unofficial strike by almost 30,000 clothing workers in Leeds, in 1970. They demanded an increase in the hourly pay rate of one shilling [5 pence, worth about 75 pence today, taking inflation into account]. The action snowballed as the strikers, mostly women, marched around the city calling on others to join them. They were angry that their trade union had signed an agreement with the employers’ federation which gave men six shillings and seven pence an hour and women four shillings and nine pence an hour. This unprecedented action by women workers changed the way the union was organised – but there is a gap in traditional labour histories concerning the strike, which Liz’s research has sought to fill. This article is based on a talk Liz gave in December 2018 in London. This talk was part of the series “Social Histories of Revolution: The Long 1960s”. Why is a strike by women workers in Leeds in 1970 part of the programme? There was no revolution in Great Britain in the 1960s or 1970s. But there was an unprecedented upsurge in militant action by the working class organised in trade unions, which seemed to some on the right and some on the left to be the beginning of a revolution. The study of history is dependent upon the questions historians have asked and how they have answered them. What is the focus of their interest? What do they think is important to study and how have they studied it? What resources have they used? How have they interpreted the evidence they have found? Historians are not outside history; they are shaped by it as we all are by the political, cultural, social and economic climates in which we live and work. History has a history. In undertaking research into this little known strike I was interested in the history of women, particularly working class women and the part they played in the tumultuous 1960s and 70s. determining their overall social and political status; the changing shape of the family; patriarchal control of resources and wages; the importance of analysing women’s work and wages in relation to those of men; different circumstances of working class and middle class women. One of the most influential strikes in the Victorian era was by 1400 mostly young women matchmakers in 1888 in the Bryant & May factory in Bow, east London. Ben Tillett, one of the leaders of the dockers’ 1889 strike, paid tribute to the young women workers – sisters, mothers and wives of the dockers – when he wrote that their strike “was the beginning of the social convulsion which produced the ‘New Unionism’”, that is, trade unions for all workers not just the most skilled. Mary MacArthur established the National Federation of Women Workers in 1906. In its short existence it fought more strikes and did more to establish women as trade unionists than any previous organisation. So there is a continuity of women’s struggle. The number of strikes per year increased significantly during the 1960s, trebling by 1970. Strikes spread from the traditionally militant areas such as mines, docks, cars and shipbuilding to the public sector. Along with the broadening of class demands went an extension of class organisation into sectors which had previously been unorganised, including black workers and women. Some tactics were rediscovered and some new tactics were used such as sit-ins, occupations, mass picketing and solidarity action. The number of strike days rose from less than five million in 1968 to 13.5 million in 1971 and 23.9 million in 1972. By the late 1960s, 95% of all strikes in Britain were unofficial. It was the greatest wave of industrial struggle since the 1920s. The militancy of the period was a significant revolt against capital, manifested both in the unpredictability of the movement and in its rank-and-file subversion of union bureaucracy. The upsurge was indicative of the increased confidence of organised workers in an era of post-war full employment as well as the development of workplace union democracy. It was also an indication of the shrinking of British manufacturing, economic crisis and the impact of new technology, with a subsequent threat to jobs. In 1972 a million people were unemployed; by 1978 it was two million. 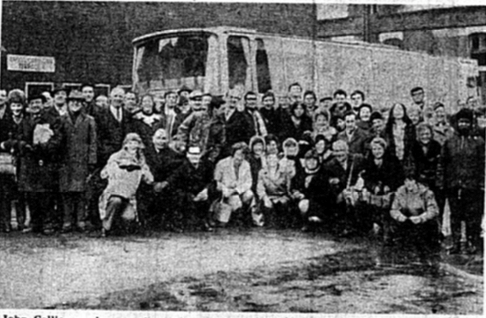 striking dock shop stewards [workplace union representatives], who were refusing to allow container lorries into the docks. Five stewards from Tilbury docks were arrested and taken to Pentonville prison in North London. Between July 22 when the “Pentonville Five” were imprisoned, and 1 August when they were released, at least 170,000 workers came out in their support. Engineering workers, printers, bus drivers, carworkers, building workers, miners, market workers and container drivers joined a huge march up the Caledonian Road to Pentonville. The previously unheard of Official Solicitor miraculously appeared and got the men out of prison. In 1972, as well as docks strikes, there was a building workers’ strike which resulted in the imprisonment of Des Warren and Ricky Tomlinson under 19th century conspiracy laws. And in 1976, Asian women in a small factory in Willesden struck in support of their demand for union recognition. They were joined on the picket line by hundreds of miners and other workers, and held out for two years. The 1970s ended with the so-called “winter of discontent” in 1979 when public sector workers across the country went on strike. A wave of rank-and-file resistance seemed part of an unstoppable advance. The Labour prime minister Harold Wilson had told the engineering union leader Hugh Scanlon to “get his tanks off my lawn”. A politician from the Ministry of Labour thought the country could well be “on the brink of revolution”. A British civil servant told a journalist in late 1973: “I have to tell you that we must prepare for a possible revolution in this country.” According to one historian, “after years of denial, it has now been proved that army officers seriously considered the possibility of a military takeover in 1974-75”. The unofficial strike by 30,000 clothing workers in Leeds in 1970 over equal pay was typical in many ways of unofficial strikes of the time. It remains a largely undocumented strike with the exception of Katrina Honeyman’s work, Well Suited, and a piece in the Trade Union Register 1970. The strike is usually considered to be of less importance than the 1968 women machinists’ strike at Ford’s, which led to the 1970 Equal Pay Act. Contemporary sources are also scarce. So, to research this, I was faced with the task of discovering sources of information sometimes rejected by academic history, such as memory. Though memory as a source has gained more credence in recent years through oral and public history in the work of historians such as Alessandro Portelli, there is a tension between memory and history. Memory is sometimes discarded as “false” rather than analysed as an important resource which even in its “falseness” can reveal much historical information. I made contact with some of those who had been involved in the strike to explore what they remembered, their role in it, and whether they thought it had been won or lost. This included strikers, union officials, shop stewards and supporters of the strike. It was important to consider why we remember events in the context of changing political, class and gender relationships. Who remembers what, what narratives have been constructed? Was there a mythical narrative about the strike, and does its significance relate to senses of identity as memories are altered with the passing of time? The past is filtered and framed through what has happened since, and new experiences continually shape what we remember. To reflect on the Leeds strike of 1970 is to revisit pre-Thatcher Britain in an era of massive industrial unrest, a place that might seem a foreign country to many people. 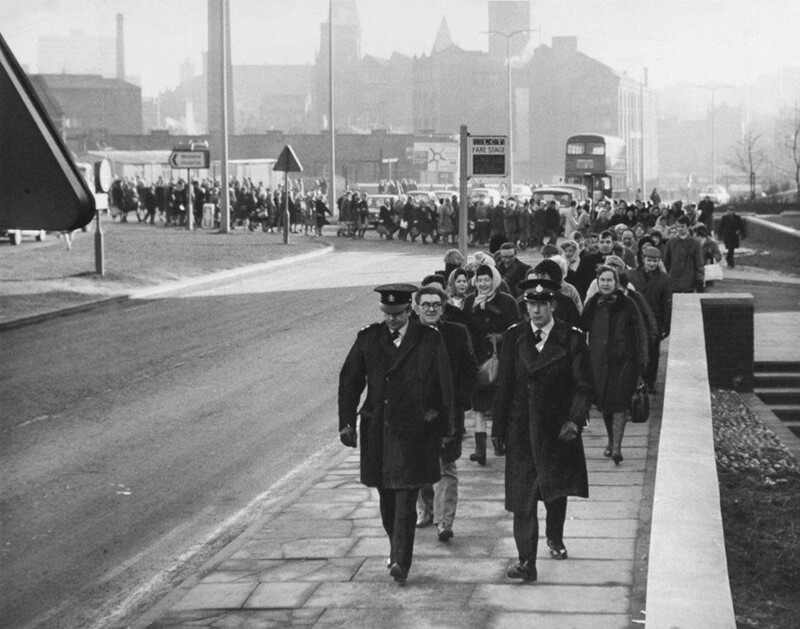 In February 1970, clothing workers in Leeds began to walk out of their factories on unofficial strike in support of their demand for a shilling an hour pay increase. The action snowballed as strikers marched around the city, going from factory to factory, calling on others to join them. “Day after day, factory by factory, workers joined the strike until there were more than 20,000 on strike”, according to the Trade Union Register. The strike was an angry response to an agreement between the National Union of Tailors and Garment Workers (NUTGW) and the Clothing Manufacturers Federation, which came into effect on 1 January 1970. This established new minimum rates of 6 shillings 7 pence an hour for skilled men and 4 shillings 9 pence an hour for skilled women, with decreasing rates of pay for less skilled workers. It also introduced the first nationally-negotiated productivity agreement in the industry. Low wages, differentials between men’s and women’s rates of pay, and an unacceptable productivity agreement, were all factors behind the strike. The Leeds employers still do not know quite what hit them. They freely admit they never dreamed a calamity of this size could ever befall an industry whose workers, mostly women, have so often been content to accept a low wage rather than travel a mile down the road for something better . . . We witnessed a unique spectacle of not only women marching through the streets of the city, but also female pickets calling at individual factories in an endeavour to bring out the work people in support of the strike. This must be almost unique in British industrial disputes. The relatively inexperienced strikers employed the technique which came to be known as “flying pickets”, a method of organising which was prominent in later miners’ and building workers’ struggles. to recommend a return to work, so that the union could being negotiations with the employers. The rank-and-file strike committee was outmanoeuvred, and the shop stewards voted to recommend a return to work, by 83 to 76. However, a mass meeting of 4000 strikers the following day voted unanimously to stay out. A further meeting of stewards was put under intense pressure by union officials, and subsequently agreed once again to recommend a return to work. This time the strikers went back. Ultimately the new agreement negotiated by the union following the return to work stipulated increases of 10 pence per hour for women and 8 pence per hour for men, on top of the increases negotiated in the previous agreement of 4 pence for women and 5 pence for men. The new agreement was subject to ratification by the membership at a special recall conference. the content of their reporting, the Morning Star called it the “tailors’ strike”, using the job title of the group of men who were the best paid in the industry, an odd choice of words as most of the strikers were women and not tailors. Workers Press was highly critical of the NUTGW leaders. The strikers complained about the lack of coverage in the national press. Though they may have been referring to tabloid newspapers, this was also true of The Times. Most of its rather late-in-the-day coverage was in the business news section, unlike that of other disputes going on at the same time in car factories such as Ford’s, or among postal workers and teachers, which were all featured on the front page and seen as having a larger impact. While Workers Press maintained the strike was betrayed, and the Morning Star emphasised the gains made by the strikers, The Times quoted the strike committee’s statement that the decision to return to work had been taken in order to avoid damaging the industry. In fact the industry was already in decline, like most manufacturing industry in Britain. The Garment Worker, the NUTGW official journal, came out each month during the years preceding and following the Leeds strike. No articles or photographs appeared to illustrate and describe the strike or its impact on workers’ lives. There were no letters of criticism of the unofficial action, or of the union’s official position, in the letters pages. [The] “militants”, mainly from Leeds, were praised in some quarters for their unofficial strike which , it was claimed, nudged the Executive Board into renewed action. But the Board were even more highly praised for having won the finest advance ever for clothing workers. The NUTGW did not want to publicise an unofficial strike in which many saw their leadership as described by one shop steward as “incompetent, inept, and at times, downright bloody cowardly”. The male-led union was not organised or motivated in 1970 to ensure that the expectations and aspirations of its largely female membership were represented. For some labour historians, the silence about the strike occurs in the context of the 1968 Ford strike, and the big and highly-publicised strikes later in the 1970s by workers who were seen as the heavyweights of the union movement. The strike lasted four weeks and was relatively short for that period. 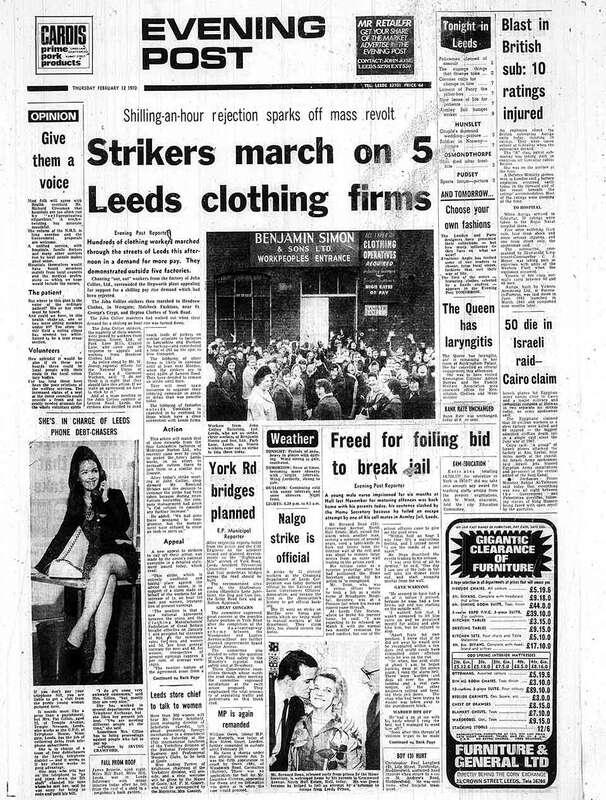 Voices from the strike are heard in an unpublished essay written in 1973 by Diane Ruth Gold, “Collective Action Among Women in the Leeds Clothing Industry”. Gold found that most of the women struggled to participate actively in the union. Between ten and fifteen women attended branch meetings regularly but “the only woman to speak regularly was Gertie Roche . . . Most women were inhibited at the male dominated meetings”. I sometimes think there isn’t a lot of sympathy with women workers, you know, it’s more or less like a man’s union. You see we’ve only one lady on the branch committee . . . All the others are men. … They, in their hearts, really think a woman’s place is in the home. By the time they’d done a day’s work and got home, and there’s a meal to make, the washing to see to, and the house to clean, and there was probably the kids to sort out, and there was everything else to do. So, a night at a branch meeting didn’t count very high on the list of priorities and could you blame any of them? These industries didn’t want to employ bodies, they were not workers, they only wanted to employ a pair of hands. Yates was disgusted with women who couldn’t do better than serve egg and bacon for dinner and challenge his authority to make decisions. He had to go on television to tell these women to get back to work and the kitchen – he didn’t have time to speak to them. We were holding a meeting in the canteen, deciding then what we were … going to do about supporting Collier’s, when some of us came and said “There’re pickets outside”. Well that more or less clinched it, with the pickets being out there … we said “down tools” and we were out. The strike was not, as The Times claimed, the work of left wing agitators, but a collective surge of anger and frustration by thousands. Two of the Leeds shop stewards, Gertie and Jim Roche, were socialists, but the strike did not start in the factories where they worked. At every meeting it has been obvious that the women are intensely involved, unleashing years of resentment. Do the employers realise that at last we are moving into the 20th century? Almost every day, reference is made to equal rights for women. Do they think this has no effect on the women who form 78% of the industry’s labour force? Many have families to feed and homes to tend. Think of the organisation and determined effort necessary to keep this up year after year. The revolt is due, not to a handful of left wingers, but to something far deeper – 20 years of neglect by the employers. At a mass meeting on Wodhouse Moor towards the end of the strike, Jim Roche addressed the skilled men in the industry and warned them of the need for unity with women workers. I want to warn the men of this industry that you have to concern yourselves more and more with the women’s conditions. When a woman looks at her wages, then thinks of the hours she works and her condition, she knows she is a slave … soon cutters will need women’s support as jobs get automated and the industry is re-organised. Five months after the 1970 strike, male cutters in Collier’s tried to negotiate a further increase in wages for themselves and 40 of them were sacked. had just wiped out everything that had been gained in relation to unity during the strike by that very act … of going behind everybody else’s back and trying to negotiate a very high increase for themselves. Well you can’t do this. If you want to lead people, you’ve got to be open, haven’t you? The most extensive source about the strike is a film, Leeds United! made in 1973 and televised in 1974 as a BBC Play For Today. Written by Colin Welland and directed by Roy Battersby, the film was based on real events and filmed in Leeds, using many of those who had participated in the strike as extras and advisers. It was the most expensive drama ever produced for television at the time, with a cast of 300 and a £154,000 budget. Leeds United! is in this tradition, influenced by developments in British theatre and cinema and freed from the TV studio by new technology. Politically committed scripts were part of TV’s “cultural revolution” in this period: a revolution in which audiences became used to the working class describing their own experiences, and to having writers and actors take up those experiences and expand on them in fictional forms. Summarising and condensing events, the film shows the complex relationships between workers and stewards, stewards and union officials, and union officials and bosses in a visual form. Presenting the story of the strike through the story of individuals, acting very much as part of a collective, emotionalises, dramatises and personalises it. In addition, the film shows the story of the strike as an integrated social and political process. One of the strengths of Leeds United! as history is that it was made not long after the strike, in the streets and factories of Leeds. As with many of the Wednesday Play and Plays For Today, the period it is about is also the period in which it was made. Describing the process of involving clothing workers in filming, Battersby pointed to the power of the collective experience the former strikers brought to it. The film caused a big uproar in the local papers, among union officials, employers and the Communist Party, who objected to the role played by one of its members in the film. Because of the controversy, an arts talk show called In Vision (televised on 1 November, 1974) devoted the whole of one of its programmes to the film. Employers, union officials, three women shop stewards, including Gertie Roche, and the producer of the film participated in the show. In the local papers the women were portrayed as being very critical of the language used in film. There was a bit of mild swearing in the film – some of the strikers said “bloody” and “bugger”. On the In Vision programme, Gertie Roche said she thought the use of language was justified because of the strength of the emotion and anger of the strikers. And I was very nervous, and they started coming out. I was across the road from where they were coming out through the gate and they spotted me and I thought, oh god here we go. And there was this great cheer and they all crowded out across the road and I’m like, so you liked it then? Oh we loved it! And these were the same people who were quoted in the newspaper making negative comments about the language used in the film. So I said, what did all that mean, then, all that talk about you don’t speak like that and they said, oh that’s just for him indoors, if he thought I spoke like that, he’d break my neck. For some at the time, the calling off of the strike was a betrayal, the strike was spreading and with a clear leadership more could have been won by the strikers. For others, the story is of a limited victory – the wage rise was eventually forthcoming and was more substantial than had ever been won before. For the women involved in the strike there was qualitative change both in their understanding of what the trade union movement could offer them and a recognition of the role they could play and of their importance to the union. Liz Leicester is a historian, adult education tutor and trade union activist. Her research has included the impact of the 1798 Irish rebellion on English Chartism, radical movements in Victorian England, local history in areas of north west London, the impact of memory on historical constructs and the role of women in the British trade union movement. She has tutored for the Workers Educational Association and UNITE, and was chair of the Camden local government branch of Unison for 14 years. 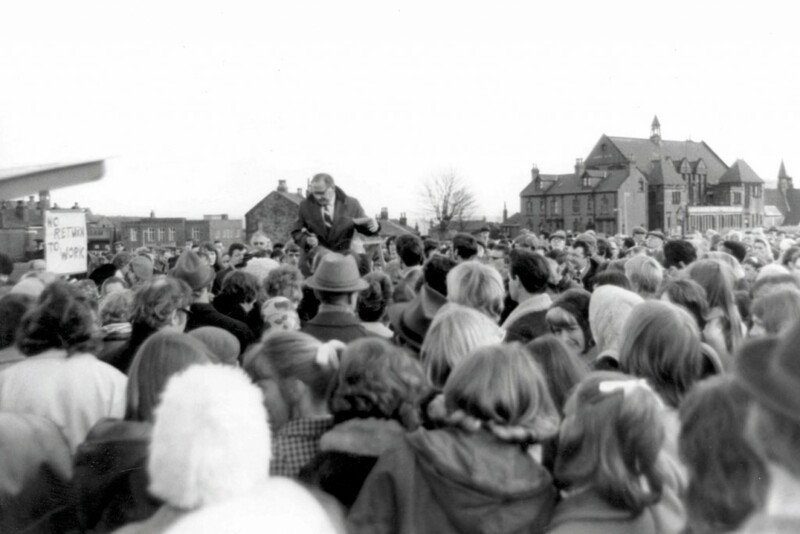 This article is the text of a talk, based on research for an MA in Public History entitled “‘It was a serious time’ – The 1970 Leeds Clothing Workers’ Strike as Public History” (2007, Ruskin College, Oxford). An article based on the research, “The 1970 Leeds Clothing Workers’ Strike: Representations and Refractions”, was published in Scottish Labour History, volume 44, 2009. ■ Leeds United!, the film mentioned, appears to be available on Vimeo here. These amounts are in old UK pounds, shillings and pence. Before decimalisation in 1971, there were 12 pence in a shilling, and 20 shillings in a pound. Six shillings and seven pence = just under 33 pence in post-1971 money, worth about £4.85 now, taking inflation into account. Four shillings and nine pence = just under 24 pence in post-1971 money, worth about £3.48 now, taking inflation into account. Sheila Lewenhak, Women and Trade Unions (London: Ernest Benn Limited, 1977), quoted on p. 22. Ben Tillett, Memories and Reflections (London: J. Long, 1931), p. 122. Sarah Boston, Women Workers and the Trade Unions, (London: Lawrence & Wishart, 2015), p. 60. John McElroy, Nina Fishman and Alan Campbell, British Trade Unions and Industrial Politics, 1964-1979 (Aldershot: Ashgate, 1999); Richard Hyman, Strikes, (Aylesbury: Fontana, 1984); Chris Wrigley, British Trade Unions Since 1933 (Cambridge: Cambridge University Press, 2002). Ralph Darlington and Dave Lyddon, Glorious Summer (Londojn: Bookmarks, 2001), pp. 141-174. Sheila Cohen, “The Upsurge: 1968-74” in Ramparts of Resistance, (London: Pluto Press). Katrina Honeyman, Well Suited (Oxford: Oxford University Press, 2000); Jim Roche, “The Leeds Clothing Strike”, in the Trade Union Register 1970, eds. Ken Coates, Tony Topham, Michael Barratt Brown (London: Merlin Press, 1970). Alessandro Portelli, The Death of Luigi Trastulli and Other Stories (Albany: State University of New York Press, 1991) and The Order has Been Carried Out (Basingstonke: Macmillan, 2003). Sheila Rowbotham, “The Subversive Who Surprises: Ken Loach”, in Looking at Class (London: Rivers Oram Press, 2001). Liz Leicester, Interview with Roy Battersby in “It was a Serious Time”, MA Thesis, Ruskin College.